Heat the oil in a large non-stick frying pan over a medium heat. Add the beef mince and cook for 8-10 minutes until browned all over. Stir in the seasoning mix (from the soft taco kit) and the water. Bring to the boil, then reduce the heat and simmer for 10 minutes, stirring occasionally, until thickened. Heat the tacos as directed on the packaging. Divide the beef mixture between them. 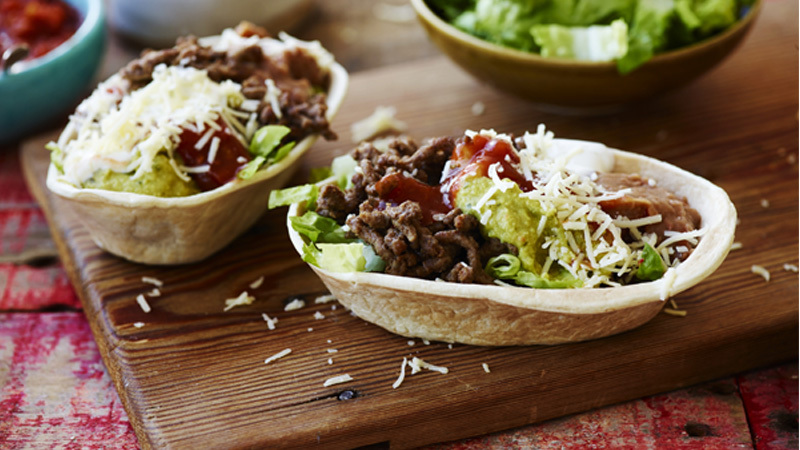 Top each with some of the refried beans, soured cream, guacamole, grated Cheddar, lettuce and a drizzle of the taco sauce (from the soft taco kit). Serve immediately. Try turkey or chicken mince instead of the beef for a change of flavour. For home-made guacamole, simply mash together 2 stoned and peeled avocados with the juice of 1 lime, 2 tablespoons chopped fresh coriander and 1/2 red onion, chopped. Season to taste.